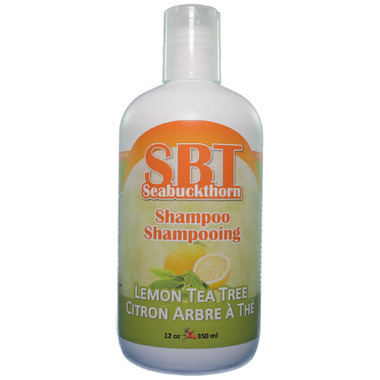 SBT Seabuckthorn Therapeutic Lemon Tea Tree Shampoo was specially formulated with lemon and tea tree essential oils to combat dandruff and balance scalp oils. SBT Seabuckthorn Oils with other nourishing botanicals add moisture to a dry scalp while adding strength and shine for squeaky clean tresses. Directions: Anti-dandruff shampoo for normal to dry hair and dry scalp and dandruff. Squeeze a dime (to quarter) sized amount of SBT Seabuckthorn Therapeutic Lemon Tea Tree Shampoo into your palm, rub hands together and massage into hair and scalp. Rinse thoroughly. For best results use with SBT Seabuckthorn Therapeutic Lemon Tea Tree Conditioner. Natural, Gluten Free, Sugar Free, Dairy Free, Peanut Free Product, Tree Nut Free Product, Canadian Brand. This is the only all natural shampoo that I've tried that stopped the itchy scalp and reduce hair loss effectively yet gentle enough for eczema prone skin. It doesn't dry the hair and the ingredients are very pure. The price is a bit higher than I normally pay for a shampoo product, but it delivers the results that I needed so I was willing to pay for the price. I just wish more local Toronto stores would start carrying it so I have the option to pick it up whenever I need to and not worry about shipping. Goodl shampoo and has a great scent. Lathers Ok, but I find it very watery.